I’ve been on a kick lately- zucchini muffins, zucchini lasagna, zucchini boats. It’s finding it’s way into everything I make! If you have yet to try any of the said zucchini recipes up to this point, I’m going to say this one is probably my favorite. That’s excluding the muffins; I’m referring strictly to the savory recipes. Muffins will always win because they’re muffins. So I really, really loved the lasagna but to be honest it wasn’t something I would make on a weekly basis. Why, you ask? Because I’m lazy. On the other hand, these Vegan Zucchini “Meatballs” are waaaaay easier. They require less than 10 ingredients and 20 minutes to make, and all you have to clean is a bowl and a food processor. That’s the kind of recipe I like to have on repeat. By the way, I have a quick question for you: does calling these zucchini “meatballs” bother you? I’ve seen a lot of people express annoyance by the use of meat-related words when referring to vegan food. I know it doesn’t make sense to call something that’s meatless meat but when people go to search for vegan recipes, they are more likely to use those terms. Or that’s my suspicion, at least. Anyway, let’s get back to the balls. 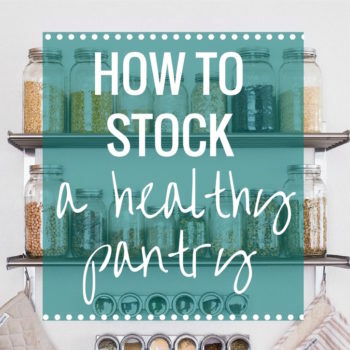 In addition to being fairly simple, they’re also packed full of plant protein and fiber, making them a nutritious option to have on the meal plan. You can even prep them ahead of time so that they’re ready to bake and serve on busy weeknight. 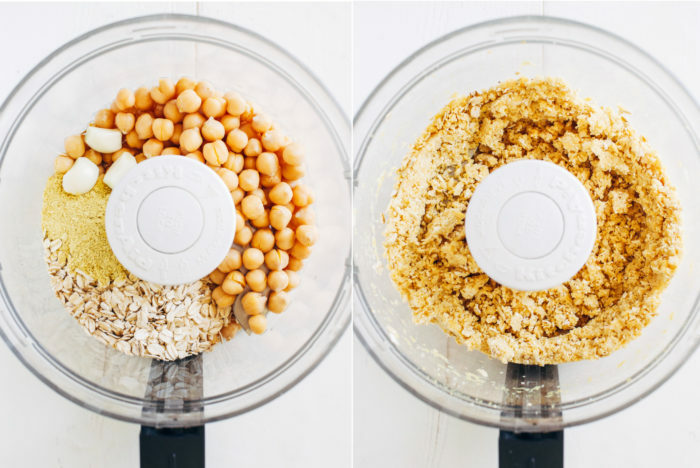 In the bowl of a food processor, combine the drained and rinsed chickpeas, garlic cloves, and rolled oats. Pulse for about 5-10 seconds, until finely chopped. When you press the mixture between your fingers, it should hold together. Transfer to a large bowl along with the dried herbs, salt, nutritional yeast, lemon juice and shredded zucchini. Do not use more than 1 cup of shredded zucchini. Stir together until well-combined. If the mixture is too wet to handle, add a little flour (you can grind extra oats into a flour) or nutritional yeast to help absorb excess moisture. Preheat the oven to 375°F then line a baking sheet with parchment paper. 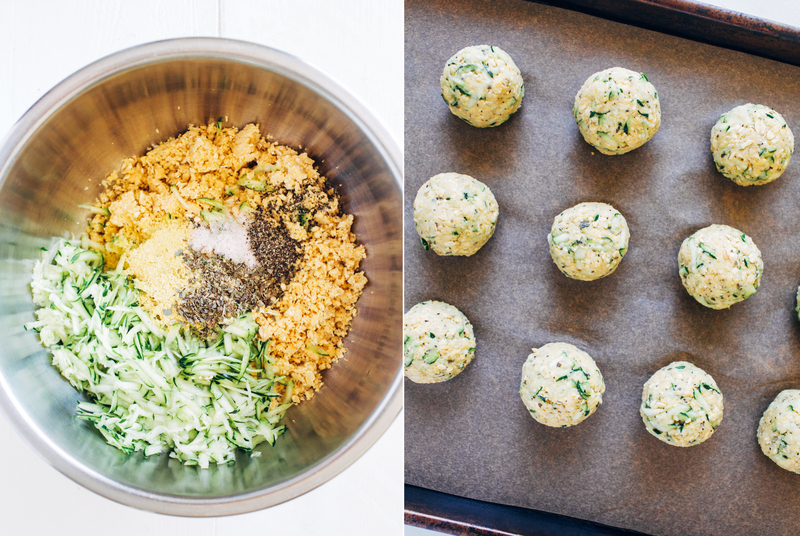 Using your hands, scoop out on heaping tablespoon of the zucchini mixture at a time and roll into 12 separate balls. Arrange on the baking sheet a few inches apart then bake in the oven for 25 minutes. Meanwhile, cook pasta as directed. I liked these but felt like they could use more flavor. Any suggestions? Also I had to cook mine much longer. I felt like they were still to “gooey” in the center at 25 min, and my batter was not too wet. Sorry these didn’t turn out well for you! It could be that your zucchini was too watery which drowned out the flavor and made them soggy. If you used the proper amount (measured in a cup) then I’m not sure what went wrong. I had the same issue I baked them and even put in in longer because the inside was mushy and I measured everything right.. however after I added onions, green and red peppers to the dough and then fried it and then let it cook a little in the sauce and it was amazing. To me, it makes sense to call these meatballs. If someone’s looking for something to approximate/replace meatballs, or if they’re cravin ’em, they’re not going to google “vegan lots of plant based ingredients baked in a sphere”. They’re gonna google “vegan meatballs”. I don’t see the problem in calling it what it is, haha! Helps the most people find it and helps the people reading the recipes know what you were going for. I find it more succinct and descriptive than just CHICKPEA ZUCCHINI ORBS or whatever the alternative would be! And vegan meatballs is what I Googled and now here I am. I will be calling them chickpea zucchini orbs from now on. Don’t be sorry, I can never get enough zucchini. 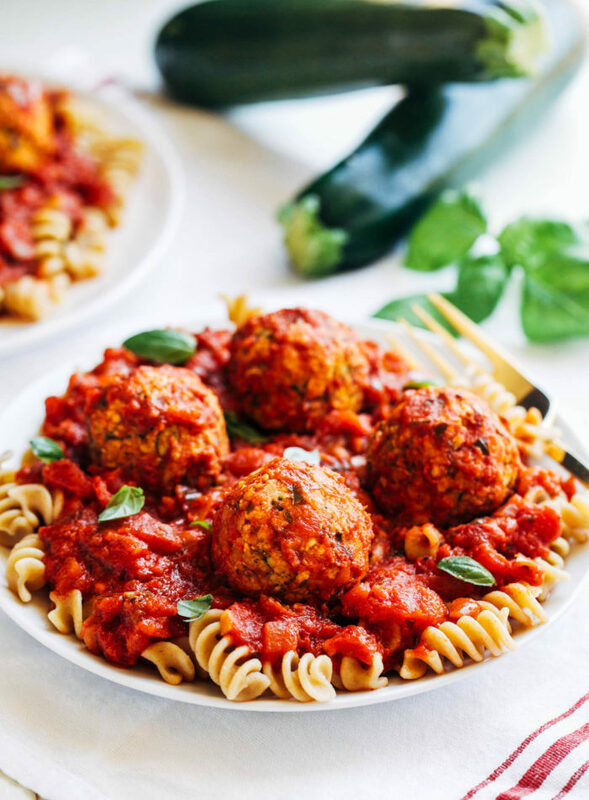 These zucchini meatballs are amazing! I eat zucchini like crazy year round and always look for new recipes. Pinning! Bring on the zucchini recipes!! haha I have been using zucchini in my kitchen like mad lately and the kick shows no sign of stopping! These sound and look SO good!! In my minds eye you’re in the airplane galley and hotel restaurants whippin up these delicious recipes for us Sarah! OMGeee! Amazing work! And when the balls are served traditional style, why not call them vegan meatballs? I mean, they are balls and their kinda meaty minus the meat! IDK! I’ve never thought about it, really. But it makes sense to me to call them what you want. This is your blog, and your recipe, right? 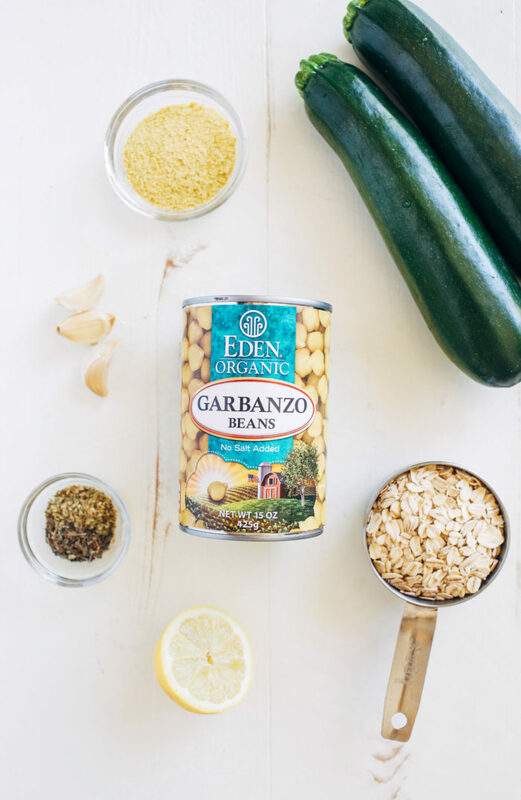 So there – vegan zucchini meatballs! I love these Sarah! Such a tasty combination of flavors.. and NO I can’t get enough zucchini right now so bring. it. on! (Rob is shaking his head tho).. :o ! LOL- yes, I am trying to get as much done as I can on the plane. Too bad they don’t all have WIFI! Soooo in gonna be “that” person haha… But I cannot have beans or processed soy. Yeah it is as in-fun as it sounds… I miss hummus! Is there anything that I can replace the beans with? I know that’s a tall order… I’m just at a loss for protein. Oh wow, I can’t even begin to imagine how hard that must be for you! I’m not sure I could survive without beans. I can’t think of anything else that would work in it’s place of the top of my head but I will think about it some more and let you know if I come up with something. I would tr Yukon Gold potatoes because they are creamy and can maybe mimic a similar binding effect. Maybe even steamed carrots? I suppose you would really have to make sure that they weren’t cooked too long so they aren’t too moist, but I think it may work. I’m sitting here trying to come up with I deas. I cannot imagine not eating beans. Flustering, I’m sure. I’m assuming lentils are a no go as well? I’m wondering about mushrooms? I spiced mine up with fennel and marjoram to taste more like an Italian sausage and I was thinking less beans would taste a little better (so maybe mushrooms and carrots and even onions). But I really liked these and was glad to find this recipe. Thank you for sharing! I think mushrooms would be delicious! Although if you used them in place of the beans it could effect how well they hold together because the chickpeas are the main binder in this recipe. You might have to add a little flour or ground flax to get them to stay together. I think a good high protein replacement for the chickpeas could be buckwheat groats. I’d cook them with a little extra liquid until fairly soft. Quinoa or brown rice could work too. Maybe add some ground nuts for additional protein? PS If you can have unprocessed soy, try edamame hummus! I’m allergic to soy, so I feel your pain. You can probably sub wheat protein for the beans. Though it’s a flower, the liquids from the zuchinni should help. If too dry, try adding a tablespoon or two of veggie broth. Oh my gosh…. Yum! I have to try these! These look SO good, and are such a creative way to have zucchini! I haven’t really been feeling meat lately, so I will need to give these a shot. Yum! THESE balls! I can definitely see them making their way into my weekly food repertoire…I love that they’re made with chickpeas and oats – SO brilliant for a well-balanced ball! Bravo, sister! I could never get sick of zucchini recipes! I can’t wait to try these! Zucchini meatballs – what a great idea! I’m a huge zucchini fan. I’m definitely going to try these! Yeah, I’ve heard people complain about “meat” terms for meatless things. I get it but I also think that people do that because it’s just a way to identify what the dish resembles. This is my ultimate comfort food dinner! 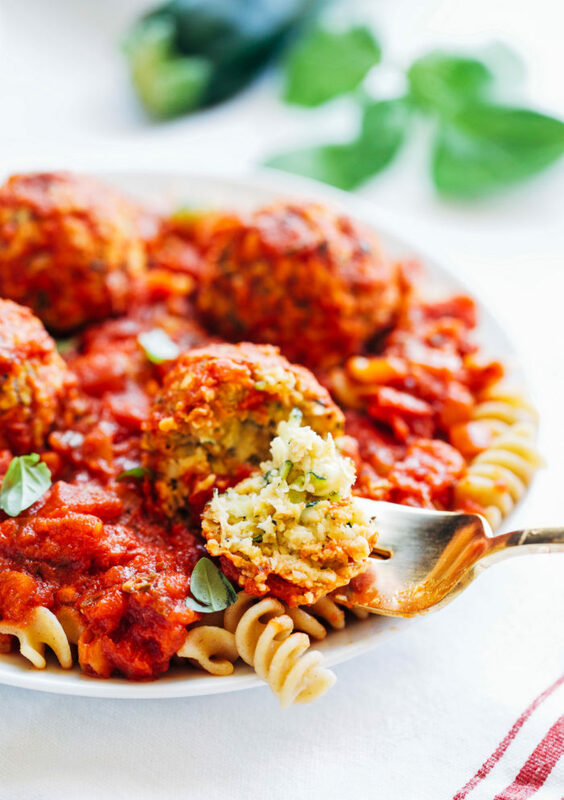 LOVE vegan “meatballs” with pasta! Super yum! I just took these out of the oven for dinner, and I rushed over to write my response: so good! These are a great alternative to real meatballs! I popped one of the “uglier” ones (not in a sphere, more like scraping the last bits out of the bowl and plopping them in a pile) into my mouth before dinner, and I loved the crispier outside! I think next time I’ll make them flat, just for the crispyness. But a delicious recipe nevertheless! Can these be frozen? If so, should they be frozen pre or post bake? Thank you for your awesome recipes! Yes! I would freeze them prior to baking. You should be able to pop them directly in the oven from frozen, although you might have to cook them longer or at a higher temperature. Any replacement for the nutritional yeast? You can just leave it out. It’s there to add a slightly cheesy flavor but it’s not entirely necessary. I try to avoid oats but I went ahead and used GF oats for this because I wanted to taste the real recipe. Those balls were good! Hearty, flavorful, and filling. I served them over zucchini noodles w/ a side of broc. Pretty easy dinner for a Meatless Monday. I would make them again! I have one who can have no oats – of any kind – any ideas what would be the best substitution ? Hi Lisa! I haven’t tried replacing the oats so I can’t say for sure. It’s possible cooked rice would work but you may need to add a touch of flour to absorb the moisture. Sorry I can’t be of more help but please let me know if you give it a try. Thanks! these sound amazing! i’m so bookmarking and making them for easy meals during the school year. Sounds amazing. Can these be frozen for future use? Yes! Freeze them prior to baking. You should be able to pop them directly in the oven from frozen, although you might have to cook them longer or at a higher temperature. Otherwise you will have to allow them to defrost at room temp for at least 4hrs before cooking as directed. I hope that helps! Thank you for this awesome recipe. I personally am not offended by calling vegan meatballs. Thank you for the feedback, Serena! I made these and they were wonderful!!! I have just one question, the nutritional info seems high on calories. Does this include the pasta and sauce or is that just for the meatballs and if so, how many meatballs is are considered a serving. To be honest, they were so good, I wanted to eat them all! Yes, it does include the pasta and sauce! For some reason the nutrition calculator I use overestimates the calories and carbs in beans. I’m in the process of looking into a better one! I wish these were “firm.” Way too soft for my tastes and I went exactly by the recipe? Anybody else have an issue with these being too soft? I even baked them 7 minutes longer. Hi Karen, it’s possible your zucchini was higher in moisture which made them softer. The overall texture is not super firm but it’s firm enough to hold together properly. You could try blotting the zucchini next time or roasting the chickpeas for about 10 minutes before blending them. That should help dry them out some! Hi Adriana, the nutrition calculator I use doesn’t account for specific brands so it’s possible the canned chickpeas and marinara sauce are increasing the sodium levels. I use chickpeas and sauce without added salt so you could try that. It really just depends on what brand ingredients you are using! Tips for those cooking in the tropics -like me in Brazil – leave the batch on the fridge for 5 minutes before rolling the balls. (The last 4 ones were really hard to make! They were just melting down in my hands). Great recipe, thank you! Substitutions for nutritional yeast? It’s so hard to find!! The nutritional yeast helps absorb some of the moisture and also adds a bit of a cheesy flavor. I would say you could maybe use flour in place of it? I’ve seen it available in a 2 pack on Amazon, definitely worth having around. I make my favourite “cheese” sauce with it. Hi Sarah, I made these last night and they were SO simple and YUMMY! Even my husband, a die-hard meat fanatic, loved them and thanked me for making them! You give the nutrition facts for 1/4 of the recipe, which includes the pasta. 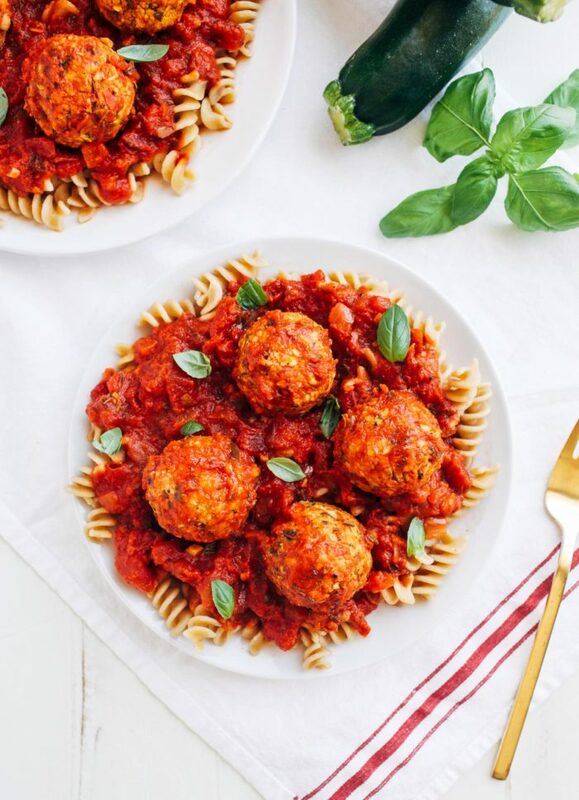 Do you have the nutrition facts for JUST the vegan meatballs? Thank you! I went ahead and updated the nutrition facts for just the zucchini balls without the pasta. I figure it’s easier to add on the nutrition info for whatever kind of pasta (if at all) than it is to take it off. How do you go about shredding the zucchini? Can I just put it in the food processor, or grate it? Does it need to be cooked or peeled? I want to make sure I don’t mess these up! I made this recipe yesterday. The “meatballs” tasted good but they were not firm, how can I correct the recipe the next time? It’s possible that your zucchini was on the watery side or that you used too much. Check to make sure you’re not using more than 1 cup. If the mixture is too wet, you can add a little bit of flour (or grind the oats into a flour) to help absorb the excess moisture. You also want to make sure that you blend the chickpeas until they are mushy. They should stick together when you press them between your fingers. This was by far the best vegan meatballs by far!im Italian so I have missed my meatballs well not now! So happy I have found your recipes gonna try them all! can these be cooked on the stove, like in a skillet? and what if I salted and drained the zucchini before adding them and cooking the meatballs, what do you think that would do? I haven’t tried cooking them on the stovetop but I think it would work so long as you used something to keep them from sticking to the pan. And salting/draining the zucchini might be a good idea if it’s pretty watery. They always turn out fine for me as is but I’ve had a few reviews saying that they were on the wet side and didn’t hold together as well. That could help prevent that. Would this work in a blender? I’m a college student and don’t have a food processor but really want to make these! Thank you so much, I’m definitely going to make these now I’m so excited. I used my blender and it worked fine! Just a little bit more chunky. Hey Melissa! 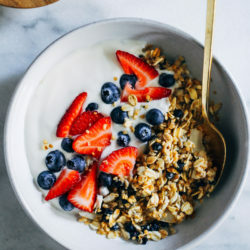 I never cook with quick oats so I’m not sure how the texture differs but I think it would work okay. Let me know if you give it a try! I just made these are they are amazing! I doubled the recipe, added some chopped onion into it and only did 1 tbsp of nutritional yeast as I’m not the biggest fan of it. I also put salt on the shredded zucchini and rung it through a cheese cloth to make sure they didnt give too much moisture and I’m glad I did because I still added some gf breadcrumbs to get rid of the slightest bit of moisture. They taste great, hold together well and have a great texture! The lemon definitely elevates the flavour! I’m so glad you liked them, Rikki! Thanks for the helpful tips!! I’m not a fan of zucchini but mistakenly bought one. I tried your recipe and it’s delicious! I must admit I’m very surprised. I will be making them in the future. Hey Aubrie! The nutritional yeast does absorb some of the moisture but it’s also possible that your zucchini was on the watery side. Next time you can try squeezing it with paper towels first or adding more flour to help absorb the excess water. I hope that helps! I tried this recipe but it wasn’t the greatest mix. I wasn’t able to get these to stick together very easily so they were less like meatballs and more like a mix of oats. I wasn’t so impressed with the result although they did taste good. Sorry they didn’t turn out well for you, Charlotte! It’s possible the oats and chickpeas weren’t blended well enough. There shouldn’t be big chunks of oats and blending the chickpeas well is what helps them hold together properly. Or it could have been that there was too much liquid from the zucchini. A few tablespoons of flour (or more nutritional yeast) can help solve that problem. I’m planning on baking these Sunday. Is the yeast necessary? And if so is it easy to purchase? I’ve never used it before. If you can’t find it, you can leave it out and substitute flour. They will be slightly less flavorful but the texture should be the same. I hope that helps! I don’t get off until later in the evenings but would love to make this!!! Is this something where I could make the meatballs in the morning, store them in the refrigerator uncooked until I get home, and then baked and serve that evening? Thanks!!! Hi Olivia! You can definitely make them ahead of time and bake them later. I’ve made them like that several times and they turned out great. I hope you enjoy them! I don’t know if I messed something up with my “zucchini balls” or what but I’m really disappointed with the outcome. I’ve never made them before so Im not to crushed since it was my first attempt but I feel like I wasted a zucchini because no one in my family will touch them… Myself included. Sorry to be a negative Nancy, do you have any advice? Hey Andrea! Sorry to hear these didn’t work out for you. It’s hard for me to help troubleshoot what when wrong with the information you’ve given me. Can you tell me what you didn’t like about them? The texture, the flavor, etc.? Could you freeze these before or after cooking? I have lots of Z to use up! Saw this recipe online and thought I’d give it a try. My son HATES zucchini, but it looked so good. I am so glad I made it anyway, the kid loved it, said we should have them more often. Personally I thought they were delicious and quite easy to make, and my husband gobbled them up too! It was a crowd pleaser for sure! Thanks! Hi Elizabeth! Yes, I think they will work fine without the nutritional yeast. That is mainly there for flavor but not totally necessary. You might want to use flour in place of it to help absorb the excess moisture from the zucchini, and maybe add more herbs to give them more flavor. I hope that helps! My husband found this recipe and made these for us one night. Since then we have remade them for friends about 5 times over! Absolutely delish, we have printed it and it will be a staple in our household that’s for sure. I’m so glad to hear that! Thanks Sarah! Made these meat balls today.. amazing!! Easy to make, taste fantastic. The turned out great! The only thing I did different is I rolled each ball in grapeseed oil and turned half way through for a Browning effect. Thanks Beth! I’m so glad you enjoyed them! What can substitute chickpeas? I don’t like them but want to try the recipe. Oh no! I accidentally cooked them all without looking as to when I should freeze them – do you think it would be okay to freeze after cooking to use for the following week? Or do you think these will keep for two weeks? Yes, I think that will be fine! Just defrost them before reheating when you’re ready to eat. I made them, and they tasted quite good. But they were very soft inside. Is there a way to change that? Also, they only browned on the bottom, where it touched the parchment paper. I think next time I will make them flatter, and flip them half way through. Or maybe try spraying them with an oil spray. My garlic cloves were a bit large, so they came out quite garlicky. I will reduce the garlic next time, and add a bit more Italian seasoning. They were very easy to make, and were just as satisfying as spaghetti and meatballs. A big thumbs up from my 5 & 8 year olds who are slowly being converted to vegan! A slow process but this was a winner, tossed in some wholewheat Panko Breadcrumbs and rolled into smaller balls. We swapped out 1/2 cup of zucchini for grated cauliflower and they went down a treat as an easy finger food dipped into some tomato sauce:) Thanks for a recipe book staple! I love it when little ones approve of my recipes! Your modifications sounds delicious. Thank you so much for the feedback, Nichola! These were delicious, loved recipe. Texture is just like a meatball should be! I’m so glad to hear that! Thanks Joanne! Hi! I’m excited to try this recipe, but I can’t eat oats. Do you have a recommendation for a replacement GF binder? Hi April! The oats are for texture and nutrition, they do not bind the ‘meatballs’. The chickpeas are what binds them. You can sub 1/2 cup sunflower seeds in place of the oats. You may need to add a few tablespoons of flour but they should hold together fairly well. Let me know if you end up giving them a try! Hi Rob! The nutritional yeast adds a cheesy flavor and vitamins but it isn’t entirely necessary. You can sub a few tablespoons of flour in it’s place. I just want to clarify that nutritional yeast is NOT yeast that you use to bake with. It doesn’t taste anything like brewers yeast! You can find it at most major grocery stores and health food stores. It’s delicious and excellent for making cheesy dairy-free sauces! These look delicious!! The sauce looks extra thick and yummy too! This turned out fantastic! I flattened them into sliders and sprinkled homemade vegan parm on top. (I shortened the cook time by several minutes) Also, they made awesome mini savory zucchini loaves with marinara instead of a ketchup sauce (I elongated the cook time by several minutes. Perfect texture!!! I’m so happy to hear that! Thanks Linda! I made the balls last night and the sauce tonight. I added half chopped carrot and a small onion to the zucchini ball mixture. I bought a jar of nice sauce with Italian tomatoes and added sautéed onion, mushrooms and zucchini to it and let simmer for thirty minutes. I put the meatballs on top of the sauce to let them get warm and absorb some of the sauce. I served with vegan parmesean cheese from VioLife. The big test was whether or not hubby would approve. He really liked it. Thank you for this great recipe. I think next time I will make the balls smaller as I think I would like them a bit crisper. I was planning to make these for a work potluck bridal shower. The bride is vegan and we all are trying to make sure there is plenty for her to eat. 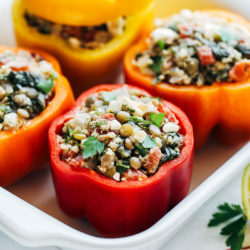 Would these hold up if they were put into a crockpot with sauce to keep warm? I think they might get mushy if they soak in the sauce for that long. You could try to spread a thin layer of sauce on the bottom to keep them from sticking and set the crockpot to warm. Then serve extra sauce on the side. Sorry they are a little tricky since they’re meatless but I think that’s the best option! 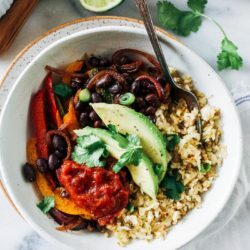 I just made this for dinner tonight because my carnivore husband and I are attempting a 3x/wk vegetarian diet (environmental and health being the main drivers, but also because I want to raise my kid with better eating habits than her dad!). My daughter LOVED it. She’s 21mths and picked the pasta off her plate (never does this — loves pasta normally) and ate FOUR meatballs (which we call plantballs). It’s going in the rotation for sure. Tomorrow, I will make your corn fritters. Oh also, husband accepted it, and even agreed to pack for lunch tomorrow. It’s a win! I thought they were delicious. I did add some extra chickpeas flour before forming into balls because it was a little wet (and I had the flour in preparation for the fritters tomorrow anyway). Yay! So glad everyone enjoyed them. Thank you, Yin! Great for my first cooked vegan meal. I usually love any chickpea recipes and I am a real vegan. I thought these were ok. I might try adding some spinach or something to help. Did not care for the lemon flavor but they did come together nicely. Sorry! I made these yesterday with marinara sauce and they were a hit with my family and I took some to a friend who also liked them. It’s a definite recipe keeper that will be repeated over and over. I look forward to trying other recipes. 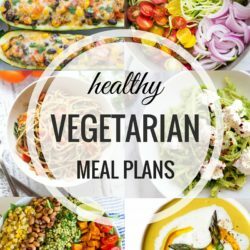 We have become more health conscious and eat more vegetarian and vegan. Thank you! I made these last night and I wasn’t expecting them to taste so good! I thought they may be a bit dry but not at all. I read through the other tips and salted and squeezed the courgette, glad I did as so much water came out. I’ve saved this to make again, delicious. I searched for veggie meatballs! Hey Jamie! It will probably change the texture but it should work. Let me know if you give it a try! Hi.. is it ok to skip nutritional yeast? Iam a vegetarian (but do not eat eggs) so can I use regular pizza/mozzarella cheese instead? Can these be made without the yeast? Yes but it will affect the flavor because the nutritional yeast adds a cheesy taste. You will probably need to substitute extra flour in it’s place since it also absorbs moisture. Hey mate, I need to double the recipe (got 7 mouths to feed) but I only have 1 can of chickpeas left…..
Do you think I could substitute the second can for a can of either butter beans (which are softer) or a can of brown lentils?? Hi Alex, I haven’t tried either of those but my suspicion is the butter beans would work better. Hopefully they turn out well for you! Hi! Just wondering if you can use black beans instead of chick peas? Hi Annie! I haven’t tried black beans so I can’t say for sure. I think if you blend them until they stick together between your fingers then it should work fine. Let me know if you give it a try! These look AMAZING!!! Planning on making them tonight for dinner. I’m not vegan, but my husband and I have been trying to cut some meat out of our diet. Can’t wait to try these!! I haven’t tried it but I think it would! These were great – thanks so much! Crunchy and soft at the same time, easy to make and great flavour. I used fresh basil from my garden and subbed a little apple cider vinegar for the lemon juice. It’s summer in New Zealand and my courgette plants are going crazy, so it’s wonderful to find recipes to hide them in. My two omni sons liked the balls too, so I call that a win! These look so good! I just got a food processor so I’m excited to start making more complicated vegan things like these meatballs. I don’t have nutritional yeast. Is it essential to use it for this recipe? The nutritional yeast helps absorb some of the moisture and also adds a bit of a cheesy flavor. You can replace it with a bit of flour, just keep in mind that it may affect the flavor somewhat. I tried these tonight and everyone loved them! Out of necessity, I did make a few changes to the recipe. First, I couldn’t find any oatmeal in my house, so I substituted two pieces of bread. Then, I didn’t have any nutritional flakes, so I used three teaspoons of dried parsley and 1/2 teaspoon cumin. The flavor and the consistency were great! My family definitely want me to make these again, and my daughter is going to share your recipe with her vegan grandmother. Thank you for sharing your recipe with us. Vegan grandmother?! That’s impressive! I’m so glad they went over well, especially with all of your modifications. Thanks for the review, Elle! Holy sh*t! This is bada$$! Made it twice in one day, and you bet it will be become one of our mainstay. Even my son can’t get enough :) Love it!!! Haha! I love this review. Thank you, Eugenie! My husband’s (he loves meat) reaction was “oh…this is actually good, I thought it would just taste like vegetables”. He loves his Italian meals so this was a risk but he said that he would actually try to be vegan if the meals were like that one! This was such an awesome comment to read, Cydni! Thank you for sharing it with me. I’m glad they were a hit! These are delicious! We enjoyed them last summer when zuchini was plentiful from the garden. I am curious if you have any experience freezing them and if they hold up okay in the freezer? Thank you for sharing! To me, the term meatball still applies. People use the terms meat, flesh and skin when referring to fruits and veggies. 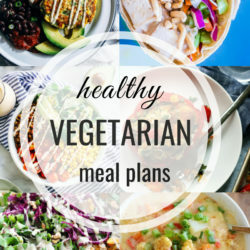 ;) I have been looking for vegan recipes to try, as I am going to do a heath experiment, by trying to go vegan during the month of May. Wish me luck, and thanks for the tips! These were delicious and so easy to make, thank you! Awesome how these are gluten free. I couldn’t imagine being vegan and gluten intolerant. But it’s definitely not impossible. Thanks for sharing! Easy to make. Mine were a bit dry. We liked it. I think I would add more of the spices next time. My idea of a heaping tablespoon must be different as I ended up with 24 balls, but were just the right size for my little granddaughter. Definitly keeping this recipe. Oh my word, these were amazing! The only problem I had was that I could not stop eating them. They were the perfect consistency and flavor. Thank you! 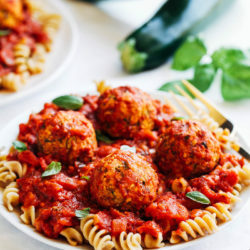 These meatless zucchini balls are delicious! I have made them twice. We have a vegan, two vegetarians, and an omnivore in our household. Everybody loves them! We make them into Subs. Put them on a roll with some sauce and top them with a little mozzarella substitute. Pop them under the broiler on low for a few minutes. Just a quick tip. If your mixture is too wet, add more oats processed into flour. I have done this both times and the balls turn out tender and moist on the inside but they hold together perfectly. Oh that sounds incredible! Thanks for the tip, Patricia! Or use the pulp left over from making Almond milk. Perfect! I put in 1/2 cup. Yes! You can freeze them prior to baking. These are delicious and so quick and easy to make, I went back for more only to realise I had already eaten them all! Thank you! I just made these! Delish! Havent even put sauce on yet. I added a tsp cumin and also used fresh basil, thyme, and oregano as I am growing it. It seemed a bit wet, so I added almond pulp I keep in the freezer, left over from making almond milk. Really tasty! Only thing I dont care for is the bitterness that nutritional yeast leaves in your mouth. I would suggest using 1Tbsp instead of 2 if you dont like the stuff! Thanks!! Thanks for the tips, Lynne! I think nutritional yeast is an acquired taste. You can always leave it out if you don’t like it! We are going to spread this recipe as far and as wide as possible! Quick and simple recipes are always a winner in our house – but when the results taste this good?! These are going to be in our rotation for a long, long time. So good, thanks for sharing it with us. I’m so happy to hear that! Thanks Andy! I made these. They were superb! Thinking next time to sub out the basil and oregano for itiallian spice blend and tomato sauce instead of the lemon juice. Was thinking of making a honey garlic sauce for them subbing soya sauce for the lemon juice. Thank you so much for a fab recipe!! Hi, I’m interested in these meatballs…they sound delicious. I was wondering if they would freeze well? I cook vegan meals when we visit one of our children, and I like to make meals ahead to freeze so I’m not cooking up to the minute before we leave for the 5 hour drive :) Thanks! Just wondering if you think these would hold up in a crockpot with sauce on warm. I want to bake them ahead of time, then put then in with sauce in crock pot for a team party. Have you tried this? Hey Dawn! I haven’t tried it myself but I worry that they will get mushy and fall apart if left in the sauce for a long time. You could bring them on the side and serve with the warm sauce but I’m not sure if that would be ideal for you. Sorry I don’t have a better response for you, lol! Great recipe. I made these for a quick late night meal for hubby. I followed the recipe to the T and it turned out great! Great job! Love EASY VEGAN recipes. Keep them coming!! I am absolutely in love with this recipe. I didn’t put lemon juice just because I didn’t have a lemon but the meatballs themselves still came out DELICIOUS. This was a fun and easy recipe to make. I was just wondering though if it would be possible to put the nutritional value of the meatballs alone? These were absolutely delicious. The garlic is so wonderful tasting. They definitely make you say “WOW” after one bite. I made these for my cousin’s vegan girlfriend when they came over for lunch, and they were a crowd pleaser! I am going to be making these again for sure just to eat as a healthier option! Awesome! So happy to hear that, Sarah. Thank you for the kind review! made them as meatballs tonight and they were very tasty..crisped on the outside but soft inside. I think they w ould also make an excellent pizza burger by just flattening them into 3-4 patties and baking them. YES! A pizza burger is a great idea. Thanks for the review, Jan! I made this recipe but made patties instead of meatless balls – & we enjoyed it! Probably not as good as if we’d made meatless balls out of it but still pretty awesome as patties. I have been trying to find the recipe again to make them – I forgot to save it – for a week now!! Definitely something you can tweak and change up the herbs and spices in too – well done, we’re fans of it!! Thank you for this recipe! These might be the best beanballs I’ve ever made. They are super easy, stick together extremely well, and they are delicious. My partner let out a spontaneous ‘MMMM’ after the first bite. 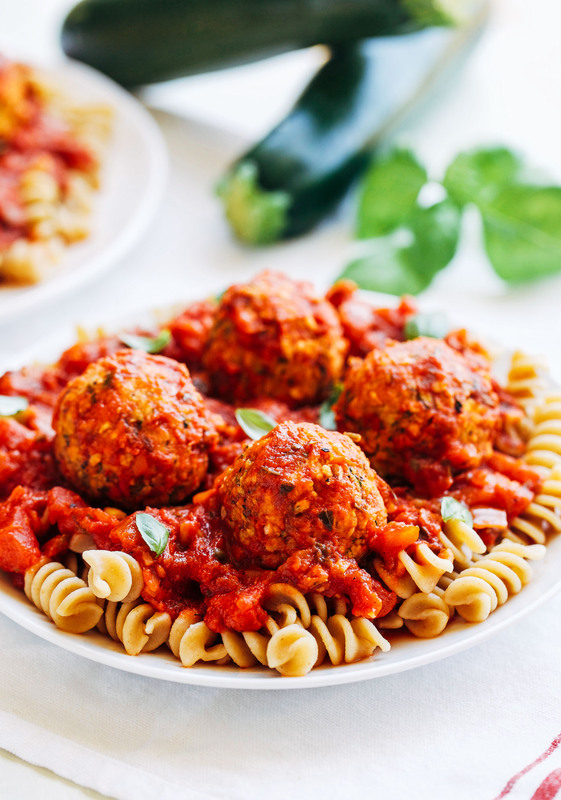 Combined with Veganomicon’s marinara sauce and whole wheat fusilli, they made a delicious and easy meal. Leftovers beanballs are going into beanball sandwiches this week, and leftover shredded zucchini are going into your waffles recipe that I just saw. I discovered your blog by searching for a vegan main meal with zucchini, and I will definitely be back for me. Best wishes for 2019! I suggest using dried garlic instead, because it was pretty strong and not cooked down enough. I love this recipe for so many reasons! 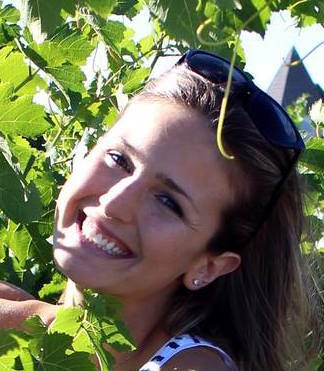 It is super easy…and super versatile! Made just as is, it is really good. It was kinda like a meatball and a falafel had a baby! I made some of he mix into meatballs, and made some into patties. Both were delicious! The second time I made them, I added a little crushed fennel seed, and they tasted more like Italian sausage balls. The third time I made them, I added cumin, dried parsley, and dried cilantro…and we ate them with tzatziki sauce! We love these meatballs!! I love your creativity! Thank you so much for the kind review! Not bad at all, I had to modify it because I didn’t have a few things in my pantry. I used oatmeal instead didn’t have rolling oats, and Italian seasoning because I didn’t have dried basil by itself. (Noticed Italian seasoning had both oregano and basil along with thyme and rosemary. I also added vegan parmesan. Really good. I wouldn’t say it’s a one bowl and food processor though. I had my measuring spoons and cups and pot for the pasta and marinara sauce and my grater for the shredded zucchini. I’m a total noob so I tend to use more utensils than are probably necessary. I was definitely impressed with this recipe. Looking forward to using it in various applications. Very YUMMY! Held together fine but very bland. Will experiment with more/additional spices next time. I loved this recipe! It was quick and easy and perfect on their own with a green salad on the side. Also, I enjoyed the fact that this recipe doesn’t use any onions or garlic, since the idea of touching these puts me off. It’s possible that they needed to be cooked a little longer. If you felt like they were too gooey then I would 3-5 minutes to the cooking time. Very good recipe I added a little onion powder and that was it, mine turned out perfect after 25 minutes! Lots of flavor I will definitely make these again next time I think I might cube up some zucchini and sauté it and throw it in with the noodles and sauce! Thanks for the recipe! I made these last night for the first time……and I’m making them again tonight!!! They were sensational!!! And I passed the recipe on to my vegan friends today. Thank you for this fabulous recipe.